Franklin Road Academy (FRA) is a private school that has approximately 900 students PK - 12th grade. The campus covers 53 acres has approximately 7 substantial buildings. These facilities include separate academic classroom buildings for lower, middle and high school, gyms, libraries, offices, administrative areas, dining facilities, athletic facilities, separate math and science building, theater/auditoriums, and chapels with several ancillary support structures. Some of the existing buildings were specifically constructed for the school and some were assimilated by the acquisition of the adjacent church property several years ago. Existing buildings on the campus date from 1950's to the most recent edition is the high school library finished in 2005. Total area of the campus buildings is approximately 54,330 sf. The Workshop has established an ongoing relationship with FRA for over 15 years. Through this relationship, the firm has provided design services for various projects large and small on the campus. These miscellaneous projects include the development of athletic facilities (soccer fields, track field, tennis courts, soccer shelters, weight room, concession stands); renovations and finish upgrades to the lower school; management of the repair of the lower school roof; planning of the connector drive; and design and installation of inspirational and memorial site markers, corridor refurbishment projects, window replacement projects, classroom renovations, and an overall campus building assessment and condition report to guide renovation and maintenance work on campus. Most recently, The Architect Workshop worked with school leadership and academic and support staff to evaluate and program the campus needs for the projected growth of the school through 2025. Analysis of the campus site and its multiple existing buildings considered renovation of existing buildings, additions to existing buildings, and development of new buildings. Balancing objectives to create a sense of community for the upper school students and to provide spaces that reflected changing pedagogical concept was critical. Site reorganization was investigated to address redirection of pedestrian and vehicular traffic patterns. Site studies also included the renovation and addition of sports fields and support buildings. The new Master plan resulted in the proposal for 3 new structures, renovation of 5 structures, creation of a new campus quadrangle, renovation and addition of sports fields and support buildings. The team worked with a construction management team to evaluate cost and design options during the design process. 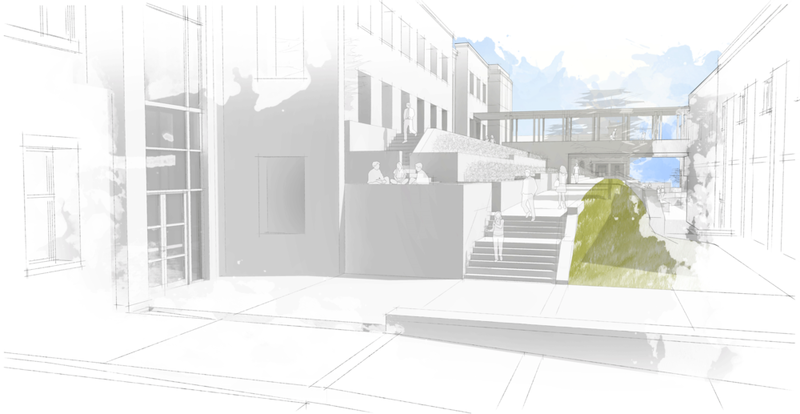 Programming and design of a new student center became the initial effort of the Master plan. The new student center for the upper school connects a new structure to the existing high school classroom building and gym. Because the new building and the proposed next phase affects existing code conditions, additional renovation within the existing building was required. The new student center addition includes a dining hall, athletic facilities, flexible classroom spaces, directed classrooms, exercise rooms, student gathering and transition space, instructor offices and school admissions office. This phase is currently in construction. A locker room addition is planned in a second smaller phase to occur as funding become available.